They're going to have to move the bus stop to the rental car facility because the ATS stop at the parking lot is supposed to be closed, IIRC. Trying to get a confirmation, but I'm hearing Pace will move the terminal for the 250 and the 330 to the Multimodal facility in February. Today at ORD I noticed that the city walked of baggage claim carousels 1 and 2 at Terminal 2. Someone told be those carousels are being renovated. There are supposedly two airlines that will be moving into Terminal 2. From what I am hearing, the two airlines are Alaska and JetBlue. I don't know what date they will move yet. Tribune says "fall" for ATS reopening. Fall could be anywhere from late September to mid December. My guess their target will be before Thanksgiving 2019. The old ats cars are on the move. These shots were taken this morning at irving pk and Taft rd. on airport property. Great catch. With the amount of the new cars onsite, it was only a matter of time before the old ones had to go. Hopefully testing will begin this summer. If you guys are interested they are testing the new ats cars. If you go by terminal 1 the last 2 days they've had a new 3 car consist over there. Yesterday it was sitting today it's on the move saw it over by the old car rental lots. The train looks strikingly similar to the other cars. Seems like its rubber tires are bigger and all its lighting is LED. Rainy day at ORD. Sighted an Aries Gilling running the All Terminals Shuttle along with the ones operated by Delaware. Didn't spot any test trains today. 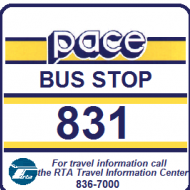 The Pace buses are still terminating at the ATS station in the E Lot. I talked to a driver operating the Car Rental Shuttles. He said their contract ends at the end of October. The west portion of the E Lot is completely fenced off, drastically reducing parking in that lot. What are they going to do with that space? I was looking and Avis is still storing cars on their old lot, so do they still have that space as an overflow lot? Everyone else seems gone and the ex national lot looks like it might be being used for remote parking. I couldn't be sure but cars were going over there like where they used to go for the car rental returns. If you go up north on bessie coleman there's a spot straight from bessie where you can turn cross the old remote lot go over the mannheim bridge and right into the rental car facility. Was looking at the remote buses said they are leased from Continental so I guess they have a pool of new flyers at there disposal. They seem to be all different years and styles of bus. if you go down mannheim they have a makeshift outdoor garage where they store them all the transportation rooms are trailers. Crazy still dont see how they would get all the riders on a 3 car set of trains. Better beef up the power cause its gonna be like the red line. You know an Uber and Lyft pickup wouldnt be bad at the rental car facility. But then again thats more people on those trains. The last time I rode one of the buses (to the rental car facility) the interior stickers were from Trimet (Portland OR). There are two Avis/Budget lots. The lot furthest south Is for vehicle storage,maintenance and some offices. The north lot eventually will belong to Enterprise. Maybe Metra can put these in service to deal with the car shortage... They also don't have seats for max capacity. Or at least give one to the Illinois Railway Museum. Hey, it’s April 1st, thought it was worth a shot.